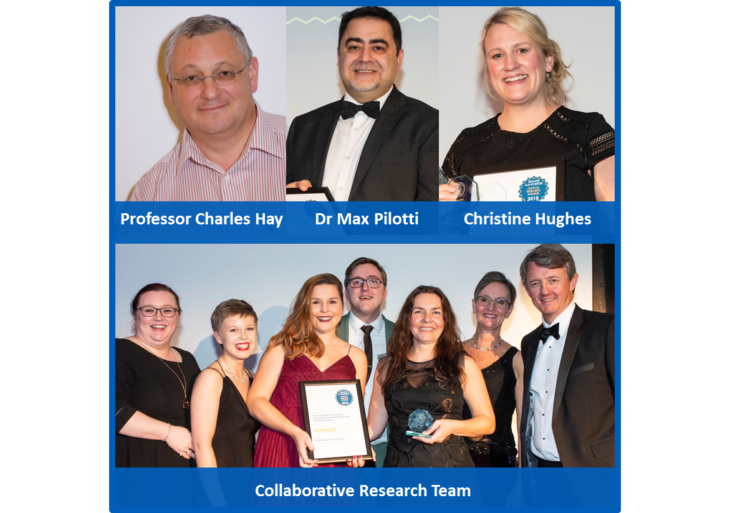 Researchers and teams from Manchester University NHS Foundation Trust (MFT) scooped an impressive four awards, including a special award for outstanding industry engagement, as the winners were revealed at the 2018 Greater Manchester Clinical Research Awards. Staff from across Great Manchester’s hospital trusts, primary care centres and other partners, gathered in Manchester city centre on Thursday 22 November 2018 for the sixth annual ceremony to toast excellence in health research delivery. This December will mark the 25th year of Professor Charles Hay’s career at Manchester Royal Infirmary. Over the past quarter of a century, there is no aspect of research into the treatment of haemophilia that Professor Hay has not been involved in in some way. The success of the Non-malignant Haematology Team at MFT is very much due to the research culture that Professor Hay has fostered. His team say they wouldn’t swap him for the world. The MFT Collaborative Research Team has an excellent morale and camaraderie and is always willing to go the extra mile to help one another out and ensure they carry on achieving excellent results. They have a fantastic reputation as a team that delivers high quality research to time and to target. This has attracted numerous companies and formed relationships with various Research organisations and is ultimately providing better outcomes for patients. Christine Hughes is extremely proficient in a range of clinical, IT and administrative duties. She ensures that studies run like clockwork by managing all the nitty gritty aspects, such as site file maintenance, recruitment, and sample processing – all with the utmost dignity and respect for patients and staff. Her colleagues say she is the most cheerful, kind and considerate presence – and the personification of an unsung hero! The Special Award for Outstanding Industry Engagement goes to Max Pilotti, he has helped companies in all shapes and sizes to navigate setting up clinical research in the NHS in Greater Manchester. His proactive and can-do attitude stands out to industry partners across the country. He has a sound knowledge of contracting and supports company representatives with clear communication and quick resolutions. Ultimately, his outstanding Industry engagement allows clinical research studies to be available to patients faster and maximises site recruitment timelines. MFT is dedicated to driving continuous improvement in the care our patients receive through clinical research by embedding a culture of research and innovation at the heart of everything we do. Congratulations to every team and individual shortlisted in this year’s awards. We had a fabulous night of celebrating the outstanding teams and individuals in Greater Manchester’s research community – Well done to all! The event was organised by NIHR Clinical Research Network, Greater Manchester (CRN GM) in association with industry partner Sanofi, who kindly sponsored the Research Team of the Year award.